Hola Uruguayos! It’s been a while since we did one of these, and I know you guys maybe thought we were out of Uruguayans to introduce, but rest assured… We’re everywhere. I’ll be able to do these posts probably for the rest of my life. If I ever run out of guys, I’ll just have kids. 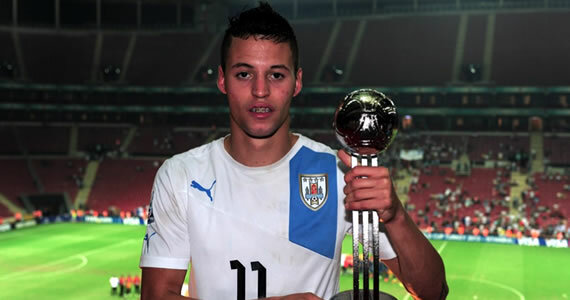 Anyway, this GTKAU is skewing a little younger than our usual ones, as we’re introducing you to one of the kids who just helped Uruguay reach the finals of the 2013 FIFA U20 World Cup in Turkey. Meet Nicolas López! Where do we start with this guy? First of all, as my girlfriend says about our cat when he poops on the carpet and I yell at him… he’s just a baby. If you’ve been paying attention so far, you know he’s not yet 20 years old. Second of all, the 19 year old has had not just one, but two ridiculous and probably offensive to him and others Uruguayan nicknames. When he first came up as a 17-year old with the Uruguayan First Division powerhouse Nacional, he was known as “El Conejo,” or “The Rabbit.” That’s because he’s got really big front teeth. The name has since evolved to the more simple “El Diente,” which means “The Tooth.” I mean… he’s got big, bad teeth… don’t make people think about why they call him what they call him, right? Anyway, let’s get on with it. Anyway, as I said, “El Diente” came up in the Uruguayan youth system with Nacional, whom you’ll recognize if you’ve been reading El Bolso’s posts. He made his debut as a substitute on April 24, 2011, and wasted no time in finding the net. He’d go on to score three goals in his five games with the big club… and then things got a little crazy. In August of that year, López’s father revealed that his son had flown to Italy to negotiate a transfer with Serie A (the Italian first division) clubs. Nacional didn’t take too kindly to that, if you can imagine. In fact, they threatened to report him to FIFA about it. They weren’t ready to sell such a young, cheap and talented player yet. López’s agent, meanwhile, contended that the contract was unfair, probably for made up reasons to get sympathy for his cause. In the end, the dust settled and López signed with Roma, who put him on their youth club for the 2011-2012 season. It wasn’t until August of 2012 that he made his debut for the big club, replacing captain Francisco Totti in the first game of the Serie A season. 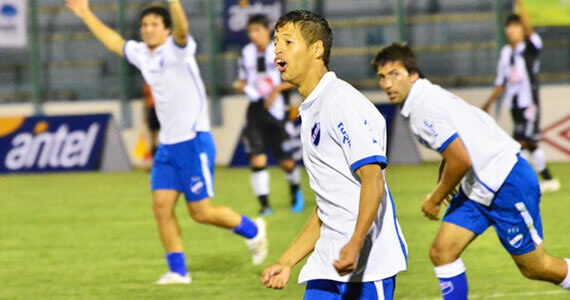 Like with Nacional, he wasted no time in finding the net, scoring an injury time equalizer. It would be López’s only goal in seven games with the squad, but what a debut, right? Despite the limited playing time, López was noticed by other clubs, and he very recently signed a transfer with Udinese, also of Serie A in Italy. According to SportsDirect News, López was being pursued by Liverpool of the English Premiere league, where he would have been along fellow Uruguayan, and one of the best players in the world, Luis Suárez. Instead, Udinese now controls the “new Luis Suárez” as López has been referred to. It will be interesting to see how López fairs with his new club, assuming they actually put him on the field and let him ball. López has never had an appearance with Uruguay’s main squadron. He will some day, probably soon, but he’s only played on the U20 team to this point in his career. He has flourished there, however, scoring 10 goals in 16 caps, including 5 in this past U20 World Cup, which was good enough to earn him the Adidas Silver Ball award for the tournament, and nearly leading Uruguay to the championship. I’m curious to see how soon we might see López named to the big boy squad. The team is pretty complete as it is, but it can never hurt to have a talented striker like López on the team, right? Uruguayan squads have notoriously favored veteran players, but I get the feeling current coach Óscar Tabárez might be a little more willing to let young guys get in there a little bit. The squad currently coached by “El Maestro” does boast Abel Hernández as a sub. He’s only 22, but has played sporadically with the main team since making his debut in 2010 at the age of 19. I’m all for the youth movement, but I think this squad might be OK with Diego Forlán, Suárez and Edinson Cavani up front and Hernández ready to sub in at any moment… for at least another World Cup anyway. If López can be groomed to possibly replace Forlán for the 2018 World Cup though, he, Súarez and Cavani might do a ton of damage up front for La Celeste.